Color: distribution cable is black. Description: Underground Secondary Distribution Cables are twisted assemblies of aluminum alloy 1350 conductors insulated with cross-linked polyethylene. This underground electrical wire is used in various underground applications in secondary distribution circuits at up to 600 volts. Conductor: Compressed Class B compressed stranded, 1350 series aluminum alloy. Assembly: Phase conductors and neutral conductors are cabled together to form a twisted assembly. As far as we know, urd wire industry has rich experience, and industry group appeals many times to be self-disciple about urd cable prices, but in recent years, urd cable prices still are disorder. The low-quality urd underground cable filled the market, then the profits was reduced drastically. The company get harmed universally, the market is disorder. Huadong Cable adhere to the market rules, send the inquiry, you can get the high-quality urd service entrance cable. According to the statistic, there are 7000 underground service entrance cable companies, and over 97% are small and medium-sized companies with privately owned. Almost of them don’t have the experience of producing ability and inspection. So many manufacturers contribute to the overcapacity of underground service entrance cable. 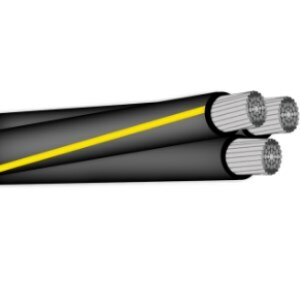 For competing the market, some companies may sale the urd cable prices in a very low price. sometimes, it mayn’t be equal to the cost. So it is a universal performance to compete with low urd cable price. The unreasonable price not only influence the companies, but also the users of urd underground cable. If a company’s urd cable price is low in a long term, it will contribute to two result. One is the that the company may be bankruptcy, the other is it will seek the new way to make up for its loose. If they develop other product, they may be unprofessional in the urd wire. Or they may use the low-quality material to reduce the cost, it will influence the quality of underground service entrance cable. As a famous urd wire manufacturer, huadong always pay attention to the quality and the price, send the inquiry, you can get a reasonable underground service entrance cable price. half of electric fire is due to short circuit of cable. If Low-quality urd service entrance cable is used in the important project, it is easily to course the fire. It may contribute to big economic loss. Meanwhile, it will make some bad social influence. So when you choose the urd underground cable, you must be careful. The price is connected with the quality. The quality is the first. Before sale, The every urd wire of Huadong Cable Group will get the strict inspection. So you can set your mind at rest to buy underground service entrance cable of huadong. Please leave your message, the best urd service entrance cable and the most competitive urd cable price is waiting for you. If you want to come and visit our factory, please leave your message, we will send the address to you within 12 hours. Welcome to visit our factory.